Rondo alla Turca (from Sonata No. 11, K. 331/300i) composed by Wolfgang Amadeus Mozart (1756-1791). For Piano. Masterworks; Piano Solo; Solo. Alfred Masterwork Edition. Form: Rondo. Classical; Masterwork. SMP Level 7 (Late Intermediate). Sheet. 8 pages. Published by Alfred Music (AP.873).ISBN 0739017241. 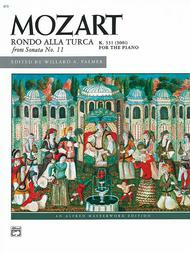 Classical; Masterwork.This is the famous "Turkish Rondo" from Mozart's 11th Piano Sonata, and this edition by Willard Palmer includes helpful technical performance footnotes.List/syllabus: WI Piano 2012-13.About SMP Level 7 (Late Intermediate)4 to 5-note chords in both hands and scales in octaves in both hands.